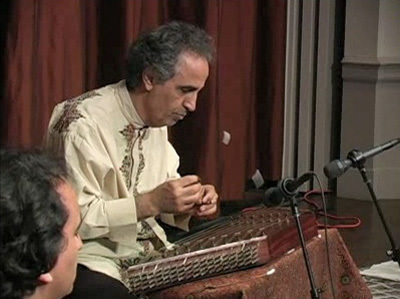 Born in Tehran, Iran, the santur master Ostad Manoochehr Sadeghi is a leading virtuoso on the santur (Persian Hammered Dulcimer) with forty-five years of professional experience both in his native Iran and in the United States of America. He began studying at a young age, becoming a prized pupil of Abol Hassan Saba, a legendary figure in Persian classical music. In 1956 he was chosen by Saba to participate in his orchestra, the first Orchestra of the State Fine Arts Department of Iran, where he continued as a soloist for many years. As a member of this orchestra and other ensembles sponsored by the Iranian Government he has performed on Tehran radio and television, concertized widely and given command performances for visits of various foreign dignitaries and heads of state from India, Pakistan, Turkey, Denmark, Great Britain, The Netherlands and America. At the same time he was engaged in teaching at the Conservatory of Persian National Music in Tehran. When he left his home country for the United States in 1964, Iranian television produced a farewell special dedicated to him.